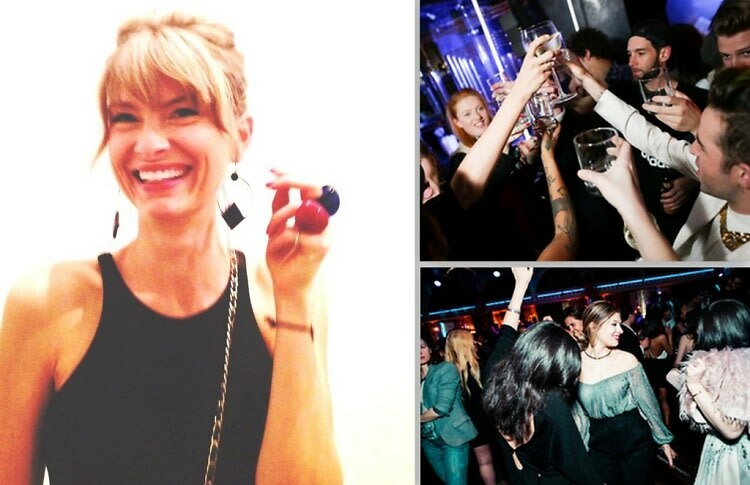 Where She Went & What She Wore: The Faberge Big Egg Hunt After-Party & More! Sometimes you've just got to party on a Tuesday... Like when storied jeweler, Faberge throws a massive fete to celebrate the finale of their citywide Big Egg Hunt. The appropriately grandiose bash was co-hosted by Arden Wohl, Waris Ahluwalia, Terri Richardson, Aby Rosen and 10 other fixtures in the social scene, ensuring that the guest list was just as hot. Surrounding a stage and under the glow of water-filled globe lamps at the Diamond Horseshoe in the Paramount Hotel, the crowd was equally theatrical. One woman dressed in white lace tights, a white fur coat and matching feathered hat declared, "now this is a party!" to nobody in particular. But before the after party comes the other after party, as I began the evening with art in general... Or make that Art in General - and their annual Spring Gala. Co-chaired by Kyle de Woody, Manish Vora and Dustin Yellin - dozens of pretty young things packed out Root studios in honor of artist Phong Bui and Sotheby's Lisa Dennison. Guests mingled amongst recognizable faces and those less recognizable…namely the ones printed on the hanging installation by David Mramor, dubbed “John Doe.” Click through to see what my outfit choice for the event-filled night!